Even though attending a large festival can be lots of fun, waiting in line isn’t. Fortunately, the Rotary Club of Ambergris Caye Belize (RCACB) will be introducing their fundraiser, “Chairs for Charity”, to rescue you from waiting in those long lines. Tickets can be purchased from each Lobster Crawl event leading up to the Block Party. For $40 BZ from 5-11:30 PM or $25BZ for either 5-8PM (first seating) or 8-11:30PM (second seating), you can get seating at tables, booth vendor menus, bar access, portable toilets inside the area, wrist bracelet for easy exit/re-entry, entry into draws for two $100 gift certificates from Toucan Gift Stores, and a chance to win a three night stay at Costa Blu. Volunteers from the San Pedro High School’s Softball Team will serve as runners for the event, and tend to your specific needs. 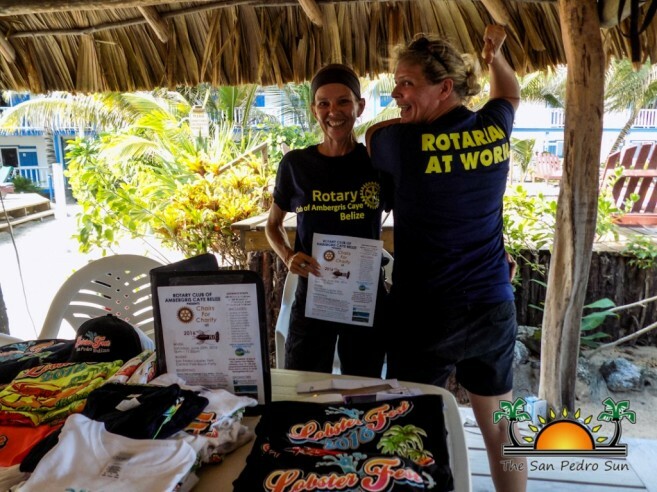 The Ambergris Caye branch is the 9th rotary club in the country, and their 30 members have planned this charity to raise funds that will benefit their community service projects. The RCACB was officially chartered on Wednesday, May 25th. As their motto reads, “Strengthening Community through Service to Future Generations”, the club hopes to get ticket holders introduced to what great services they provide within the community. “We are selling tickets to provide people with hassle-free fun. It’s also for the community to get to know who the rotary club is, and for people who are interested in joining the club. We also want people to ask questions about our club and our upcoming projects,” said Dawn Locascio, President of the San Pedro Rotary Club. Lobster Festival Block Party brings the crowd!